KSM Realty | Institutional | Who are we? Home > KSM Realty > Who are we? 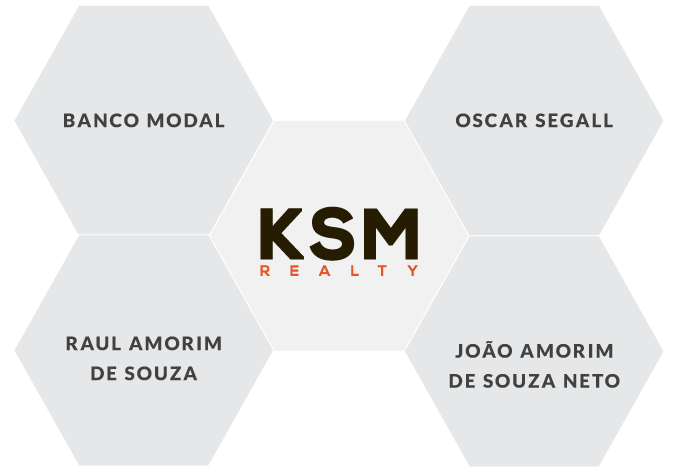 A founding partner of KSM, Oscar Segall is regarded as a real estate market benchmark, having founded Klabin Segall [KSSA3] and headed the real estate department of BTG Pactual. He has led the launch of more than 130 developments, delivered more than 25,000 units and won several sector awards. In addition to his vast experience of the Brazilian market, he also worked in the U.S., buying and selling sites and designing and developing real estate projects. A business administrator and founder of Castelo Incorporadora, he has led partnership agreements in residential, commercial, logistics and subdivision developments. With an extensive knowledge of the consulting and trading areas, he brings his expertise in process coordination and business management to KSM. An engineer and founder of Castelo Incorporadora, he contributes his knowledge of investment strategy in residential, commercial, logistics and subdivision developments. He was also head of the corporate governance and middle market areas of Banco Votorantim. Throughout its 20 years of operations, Banco Modal has transformed itself into a one-stop-shop financial institution through the development of its main business areas, which are currently the pillars of its operations. It is a merit-based partnership, whose partners play an active role in its day-to-day business activities. Expertise and integration between its various areas are intrinsic to the bank, in addition to being essential for the rapid development of products and services that are tailored to the specific needs of its clients, with a focus on the structuring and coordination of large-scale operations in the Brazilian capital and real estate markets.